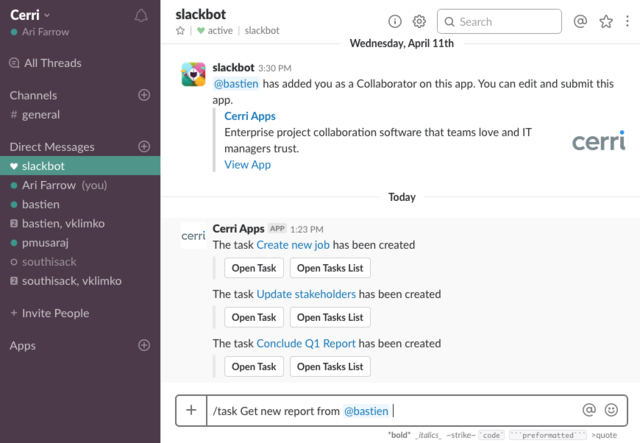 (PRLEAP.COM) Montreal, QC - April 27, 2018 Cerri releases an integration with the popular messaging platform Slack in order to help facilitate more cohesive collaboration efforts between teams. This feature is available immediately on all Cerri environments, and continues Cerri's mission to open up the world's collaboration efforts. 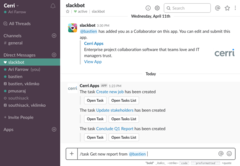 This add-on will allow users to create tasks directly from within their Slack environment using some simple commands that most Slack users are accustomed to. In addition to creating tasks, users will be able to assign duties to other teammates within their environment. "We're excited to put this integration into the hands of our users," said Vasily Klimko, Product Owner at Cerri. "The feedback we've been hearing from our users is that they want to be able to always stay up to date on what's going on in their projects. 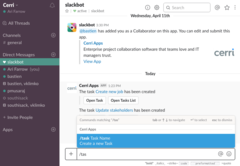 Adding a Slack integration to our growing list of integrations with Gmail and Outlook will allow all of their task management to stay centralized"
Check out https://www.cerri.com/cerri-slack/ for more information.